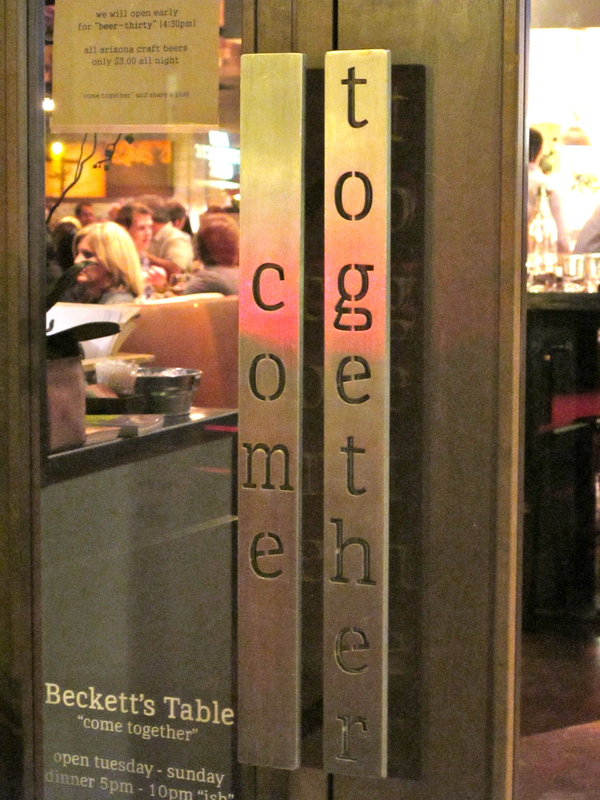 The door handles say “Come Together” when you enter, and you can tell that Justin has designed not just the menu, but the whole restaurant to have that feeling of breaking bread together. The space was transformed with reclaimed and recycled materials, something Justin documented and shared with his patrons as they were awaiting his opening. It has an open view into the kitchen with its large wood-burning oven, high ceilings with exposed wooden trusses, and there is a communal table for you to pull up a seat, should you want to make a new friend. Within minutes of sitting, Sean and I had met our neighbors and were starting to compare notes on what to order. We were the newcomers next to several seasoned veterans who had plenty of opinions and advice to share. We were told we couldn’t go wrong with the Roasted Brussels Sprouts, that the romaine salad is addictive, and that the chicken and dumplings are out of this world. Come together indeed! I will say this, I like Brussels Sprouts. I make them at home , but it took me awhile to grow into them. 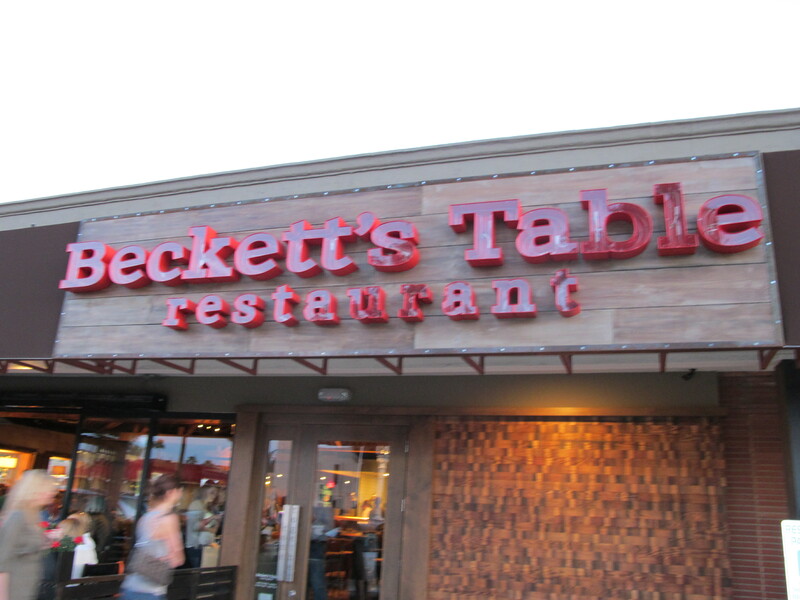 I wasn’t expected to enjoy them quite as much as I did at Beckett’s Table. While I loved the enchiladas, the chopped salad, the blood orange glazed salmon, it was the Brussels Sprouts that I am still thinking about. 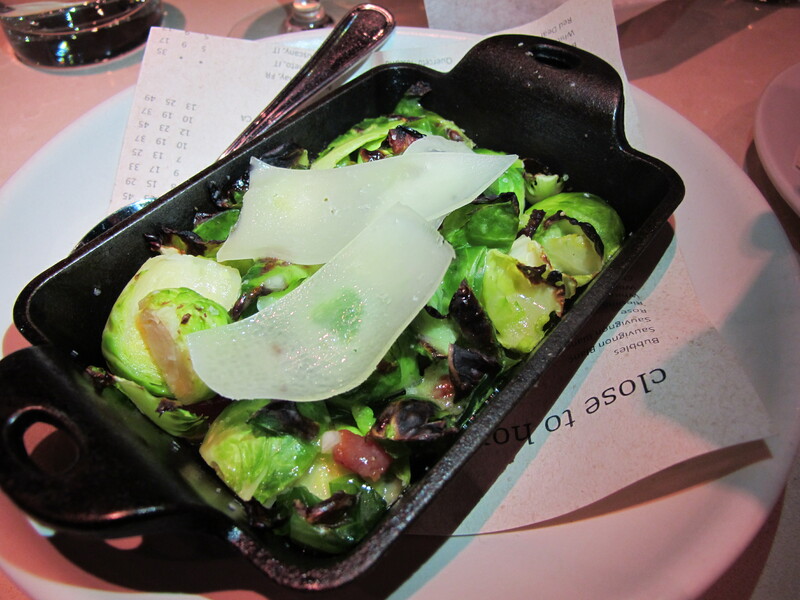 This dish was unlike anything I thought was possible, it was the next incarnation of Brussels Sprouts. 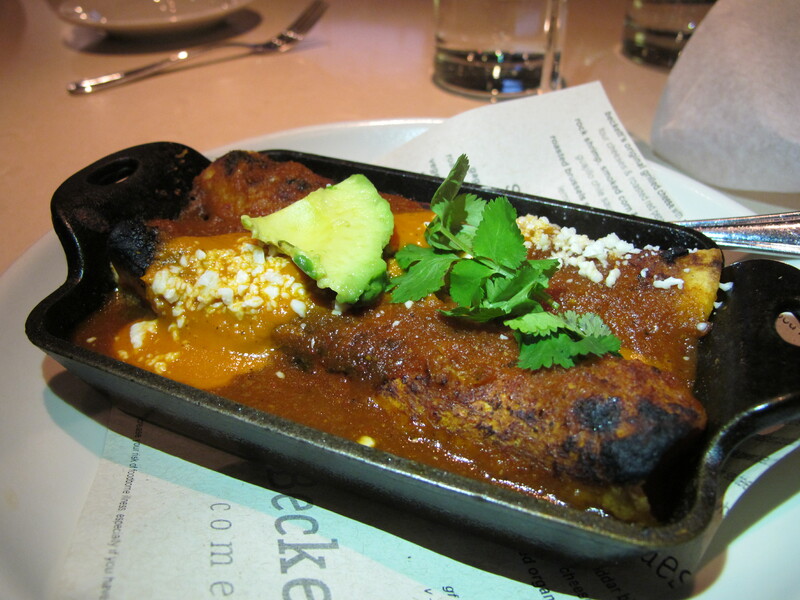 We were told that they were blanched first to cut the bitterness, then cooled, and then placed in the wood-fired oven. They came in a little iron skillet, still piping hot, and tossed with tangy lemon thyme vinaigrette and topped with smokey, salty pieces of pancetta and thin slivers of manchego. I loved it. 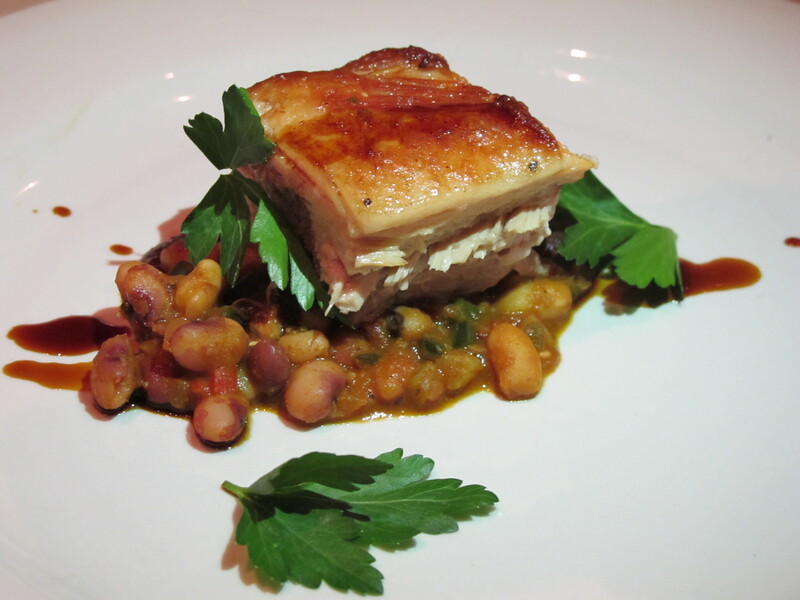 It was a rustic mix of flavors that played well together. Apparently these have become quite a hit, especially among some of our fellow diners who also confessed to not being the biggest of Brussels Sprouts fans before ordering them at Beckett’s Table. 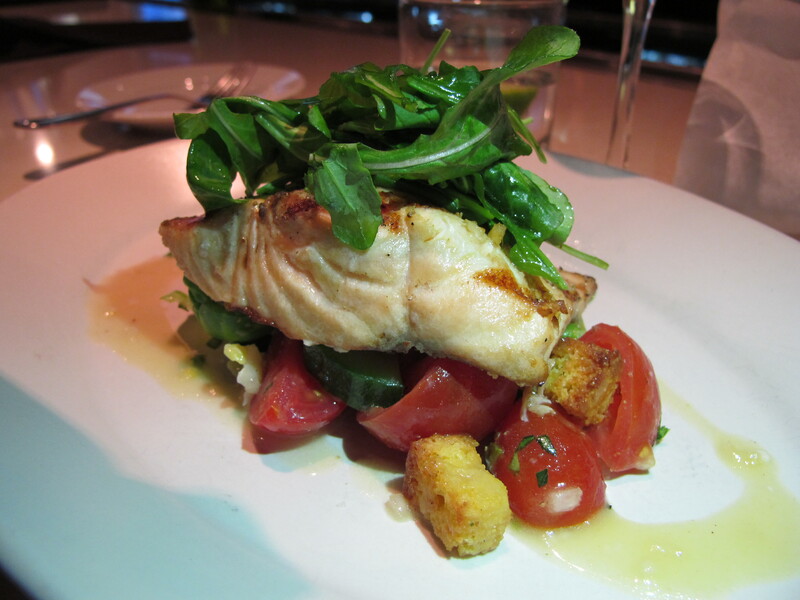 This dish will make you a convert. The vegetable chop salad was also a nice blend of fresh veggies with just a little sweetness thrown in with pieces of pumpkin seed brittle. 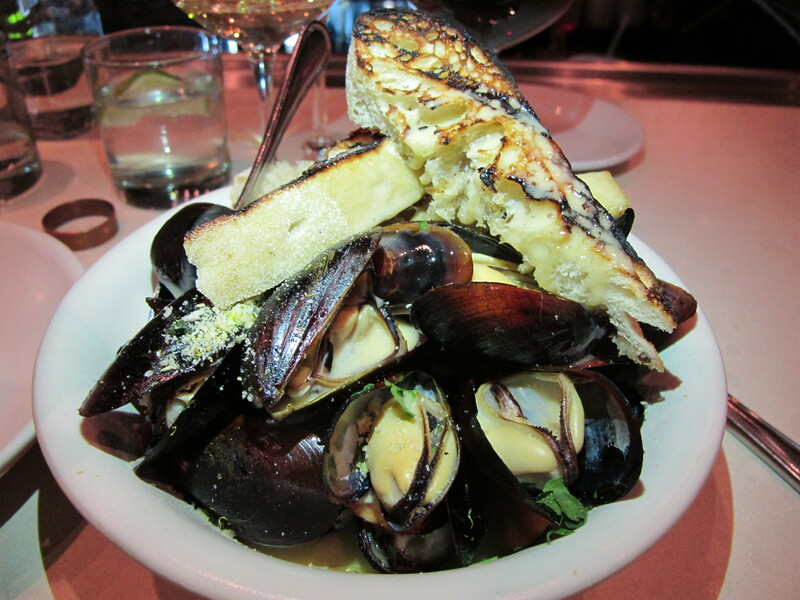 Sean loved his wood-fired mussels, but we were told before hand that the buttery garlic bread that it came with would be a downfall, and it was. The bread got a knowing nod from our new friends. They knew. Even the bartender looked like he wanted a piece. 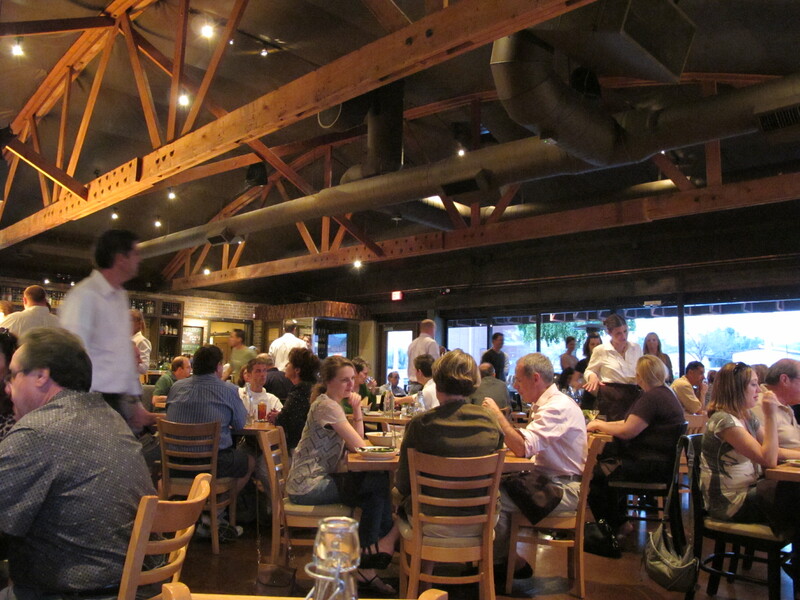 Justin is super nice and his welcoming manner is definitely felt and shared throughout the restaurant. He wants to serve well made food and have it enjoyed by friends. I think that has been well achieved. They are expanding their patio to offer additional seating this spring, which I think they will fill up quickly. 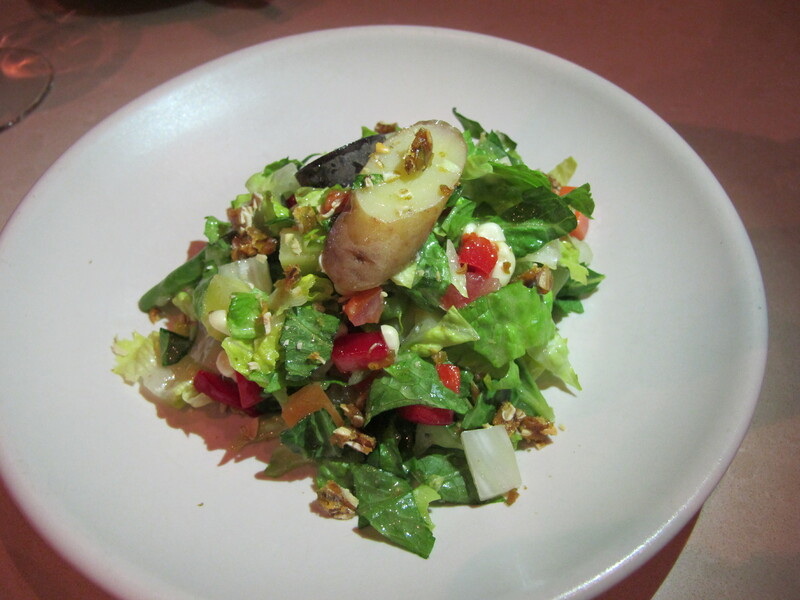 Already on my list to try next visit… the “addictive” romaine salad we heard so much about, the mac-and-cheese with crispy pancetta, and the chicken and dumplings. I have my eye on a couple of those cocktails too. The Palmaire is served with a pomegranate liquor, lemonade, and “a little bit of love”. Sounds delightful. It might take a few more visits actually. Heather and Daren – you in?? **Disclaimer… since writing this, we DID go again! 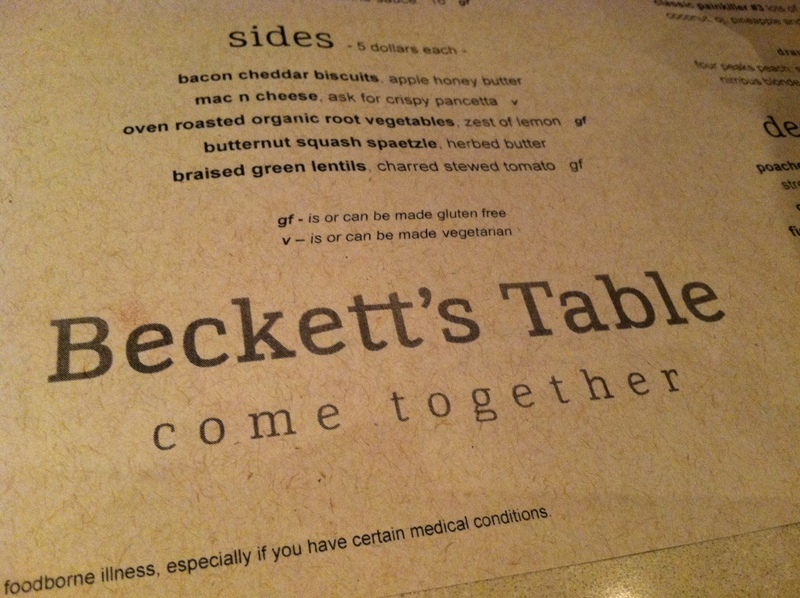 Yes – we liked Beckett’s Table that much. 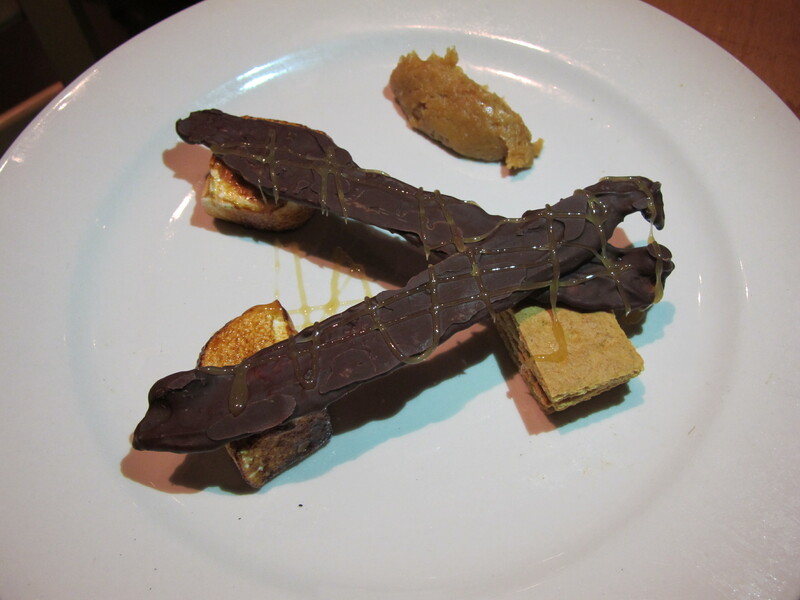 This time we took Aidan, who took one look at the Chocolate Covered Bacon S’mores and declared that he was having that for dessert. In his words, the only thing missing from s’mores was bacon. Clearly this is a hereditary thing, since I was scanning the menu for pancetta myself. Don’t let the thought scare you off, they were quite good. Sean and I may have helped ourselves to a bite or two!